The weather was absolutely gorgeous for this years season ending Mahogany & Merlot. In attendance were 13 Vintage Inboards that put on an amazing show for the spectators. Thank you to all the teams that attended this event hosted and sponsored by the Hydroplane and Racing Museum in Kent. Three new drivers had their opportunity on the water this weekend. Congratulations to Randy Christensen, Stephanie Gillmer and Kristen Nelson. Looking forward to seeing you on the water in 2015. It was a great end to an exciting and fun filled season. This years Hydrofest/Norm Evans Memorial Apple Cup hosted by Seattle Inboard Racing Association made the move to Manson, just 10 miles north of Chelan. The town and local area was in full support of this new event in their community. The citizins of Manson and Chelan County came out in force to enjoy this two day event. Six Vintage Hydros participated Calypso Too, Gang Green Returns, The Cat's Meow (mechanical issues), Water Scamp, Wee Who II and Wild Waves (Made her trailer debut, unfortunately she was unable to make it to the course due to mechanical issues. We'll see you in 2015.). The race site is great for specators to get up close and personal with the participants. Thank you to all that attended and looking forward to Vintage making a larger showing next year. This event had thirteen (13) Vintage teams putting the boat count for this event at 101. WOW!!!! The weather was extremely warm and action on the water was exciting. Unfortunately, a few teams were affected by motor issues and/or hull damage making this event the last of the season for them. Much gratitude and appreciation for your continued support. We'll see you next year!!! Thank you to sponsors Scott and Linda Carlson for their continued support of the races at Spanaway and to the following vintage teams for their attendance...Annabelle S., Buccaneer, Calypso Too, Cat Ballou, First Mate, Gang Green Returns, Gold Streak, Lil' Miss Thriftway, Madam Blue, The Cat's Meow, Tiger Too, Water Scamp and Miss Vitamilk. 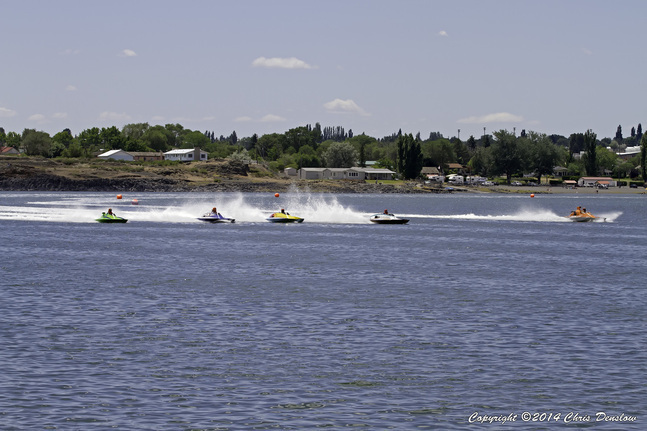 Ten Vintage Teams were at the Block Head Motors presents the Terry Troxell Memorial Hydro Cup on the Columbia River in Pateros on August 23-24, 2014. Thank you to Annabelle S., Buccaneer, Calyspo Too, First Mate, Gang Green Returns, Lil' Miss Thriftway, Miss Vitamilk, The Cat's Meow, Water Scamp and Wee Who II for there attendance.. Much gratitude goes out to the Parkers for exhibiting Calyspo E-91 for the spectators to view. Many fans were excited to see this vintage hydro and many pictures were captured with her as the backdrop. The weather was sunny, hot and the on water exhibitions by our Vintage drivers was spectacular! Congratulations to Jeff Schneider, E-1 Calyspso Too for being awarded the Terry Troxell Memorial Hydro Cup. The city of Pateros came out in force to enjoy this annual event. Northwest Vintage Hydros was a proud sponsor of this event. For those of you that were unable to attend the inaugural Oak Harbor Hydroplane Regatta on August 16-17, 2014 it was an exciting weekend. The weather was perfect, the spectators estimated between 7,000 - 10,000 people. The on water racing and exhibitions were some of the best! Thank you to Ed Kelson and Jerry Kelson for bringing Gang Green Returns and The Cat's Meow. The brothers put on a great exhibition heat! "Deck to Deck" as they say! Also, thank you to Doug Brow for exhibited Miss Vitamilk. The fans were excited to see a vintage hydroplane up close and personal. Michelle Curry, race organizer was able to award each of the 37 registered participants at this years event $100 in tow money. There were plenty of smiles when those envelopes were opened. Next year's event promises to be even bigger and better! Please visit www.oakharborhydros.com for more information. Ten Northwest Vintage Hydros were featured at the Lucky Eagle Black Lake Regatta on Black Lake in Olympia, Washington on July 12-13, 2014. The weather was HOT and so were the heats on the water. Great job drivers and thank you to all the teams that attended this event.